The Hasemiflex is a Japanese 6×6 SLR, made by Hasegawa Seisakusho in the mid-1950s. Its whole concept is very similar to the Tanyflex, which was perhaps the primary source of inspiration. 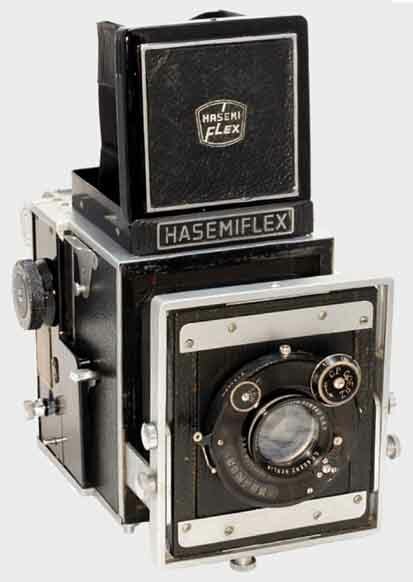 The manufacturers of both the Hasemiflex and the Tanyflex were also making view cameras; their SLR models differ from regular 6×6 SLRs, and are conceptually similar to the 1955 Rittreck (6×9). The Hasemiflex has a large wooden body with a roughly cubic shape. The front standard is mounted on rack-and-pinion structure with bellows, and it moves back and forth for focusing. It is certainly driven on a knob on the photographer's left. The lens is mounted on a removable lens board, and the camera is said to take lenses from 105mm to 150mm focal length. The front standard allows vertical and horizontal movements, but no tilt or swing. The viewing hood, above the body, has a HASEMI FLEX logo, and the HASEMIFLEX nameplate is in front of it. There are strap lugs on either side of the body. The right-hand panel has the advance knob and shutter release. The shutter speed is set by separate controls for the travelling speed and the slit width. It is said that the vertically travelling focal-plane shutter gives B, 15–1000 speeds, and that the camera has an L-shaped back and film advance by red windows. The camera was announced in Japanese magazines dated April and May 1954, then discussed again in the October 1955 issue of Shashin Salon. The camera was only known through the photographs in these magazines until recent years, when a surviving example surfaced. ↑ Kokusan kamera no rekishi, p.374, and this page of the AJCC. ↑ Wooden body: this page of the AJCC. ↑ Focal lengths: Kokusan kamera no rekishi, p.374. ↑ Separate controls: this page of the AJCC. ↑ Features: Kokusan kamera no rekishi, p.374. ↑ Kokusan kamera no rekishi, p.374. Asahi Camera (アサヒカメラ) editorial staff. Shōwa 10–40nen kōkoku ni miru kokusan kamera no rekishi (昭和10–40年広告にみる国産カメラの歴史, Japanese camera history as seen in advertisements, 1935–1965). Tokyo: Asahi Shinbunsha, 1994. ISBN 4-02-330312-7. Item 684. The Hasemiflex is not listed in Sugiyama. This page was last edited on 11 September 2010, at 12:29.